Hello! This week it’s me Charlie again. At Sapphire’s birthday party last week we had a picnic on the Isle of Oug. J’ree made Sapphire’s favourite bread rolls. We ate them warm from the oven. Mummy made a cake. The naughty Viking blew out all the candles. Sapphire was very upset. The Viking said it was an accident. Granny lit the candles again so Sapphire could blow them out all by herself. We ran lots of races and then we went to the pond to see the fish. The pond with the fish in it is very big and there is another pond beside it that’s even bigger. 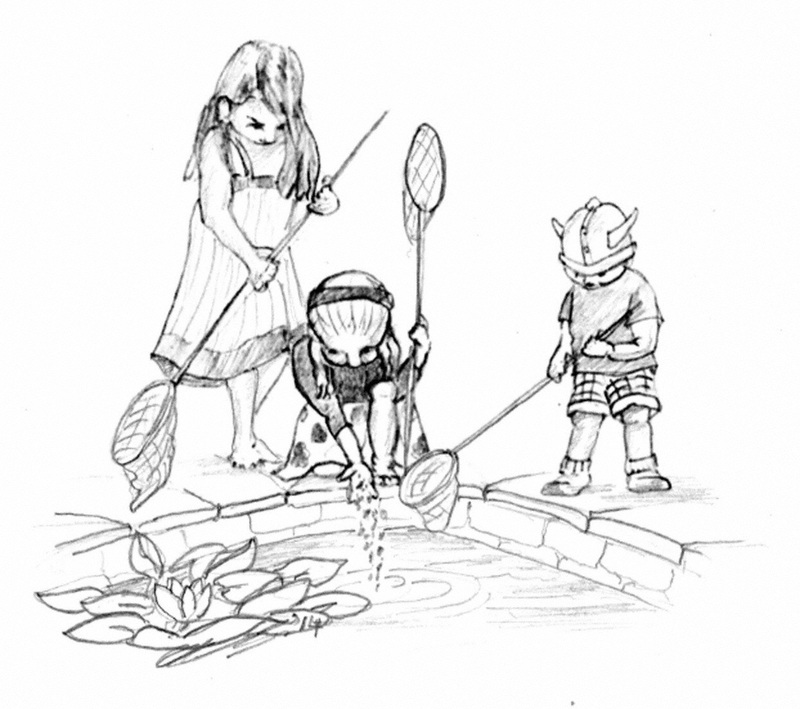 There are plants growing in the pond where the fish are and J’ree told us they are called Water Lilies. Jeremy Fisher sat on the leaves of a Water Lily. The leaves are called Lily Pads. The fish hide under them. Trisseen gave us each a handful of fish food to throw into the pond. Suddenly there were lots of fish. Sapphire, The Viking and me tried to catch them but the fish were very clever and escaped. 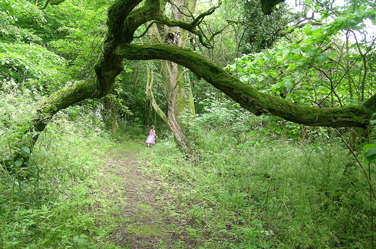 “I want to go and see the fairies” said Sapphire so off we ran into the Wood of a Thousand Trees. I like saying that. It sounds like magic. On the Isle of Oug, there’s magical wood, the Wood of a Thousand Trees. 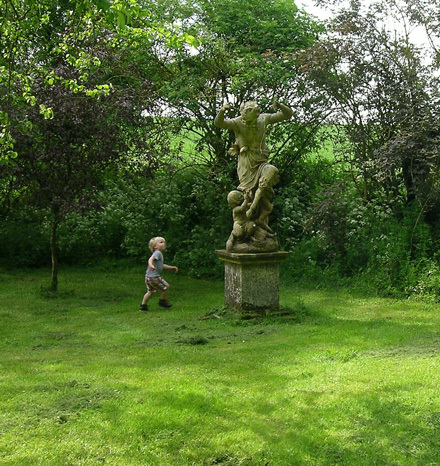 We ran and in a space between the trees The Viking was looking at an ENORMOUS statue. He looked like a dancing man but his legs and feet looked like a goat’s. He was clicking his fingers and beside him there was a baby dancing man. The big dancing man was teaching the baby how to click his fingers too. We looked at the dancing man for ages and ages. I said “I wonder who he is.” “He’s not an elf. Too big” said Sapphire. and loads to tell you about what we found at the fairy castle. This entry was posted in children, children's games, children's stories, country lore, countryside lore, fairy tales, fantasy, innocence, magic, nature, outdoor+games, The Joy of Childhood, wildlife, woods, written by Charlie Age 6 and 1/2 and tagged adventures, childhood, children's+stories, fairies, fantasy, magic, outdoor+games. Bookmark the permalink.